In Microsoft Exchange Server and Exchange Online, Messaging records management (MRM) helps organizations to manage email lifecycle and reduce legal risks associated with e-mail and other communications. MRM makes it easier to keep messages needed to comply with company policy, government regulations, or legal needs, and to remove content that has no legal or business value. Watch this video for a quick overview of how to apply retention tags and a retention policy to a mailbox in Exchange Online. As illustrated in the preceding figure, retention tags are used to apply retention settings to folders and individual items such as e-mail messages and voice mail. These settings specify how long a message remains in a mailbox and the action to be taken when the message reaches the specified retention age. When a message reaches its retention age, it's moved to the user's In-Place Archive or deleted. Permanently delete Users can't change DPTs applied to a mailbox. Permanently delete Users can't change the RPT applied to a default folder. Permanently delete Personal tags allow your users to determine how long an item should be retained. For example, the mailbox can have a DPT to delete items in seven years, but a user can create an exception for items such as newsletters and automated notifications by applying a personal tag to delete them in three days. Users can also use the Exchange admin center (EAC) to select additional personal tags that aren't linked to their retention policy. The selected tags then become available in Outlook 2010 and Outlook Web App. To enable users to select additional tags from the EAC, you must add the MyRetentionPolicies Role to the user's role assignment policy. To learn more about role assignment policies for users, see Understanding Management Role Assignment Policies. If you allow users to select additional personal tags, all personal tags in your Exchange organization become available to them. The retention age for non-recurring items (such as email messages) is calculated differently than items that have an end date or recurring items (such as meetings and tasks). To learn how retention age is calculated for different types of items, see How retention age is calculated. Archive Mailboxes in Exchange Online If the user doesn't have an archive mailbox, no action is taken. Delete and Allow Recovery Emulates the behavior when the user empties the Deleted Items folder. Provides the user a second chance to recover the item using the Recover Deleted Items dialog box in Outlook or Outlook Web App If you've set the deleted item retention period to zero days, items are permanently deleted. For details, see Change how long permanently deleted items are kept for an Exchange Online mailbox. Permanently Delete Permanently deletes messages. You can't recover messages after they're permanently deleted. If mailbox is placed on In-Place Hold and Litigation Hold or Litigation Hold, items are preserved in the Recoverable Items folder based on hold parameters. In-Place eDiscovery will still return these items in search results. Mark as Past Retention Limit Marks a message as expired. In Outlook 2010 or later, and Outlook Web App, expired items are displayed with the notification stating 'This item has expired' and 'This item will expire in 0 days'. In Outlook 2007, items marked as expired are displayed by using strikethrough text. N. A. 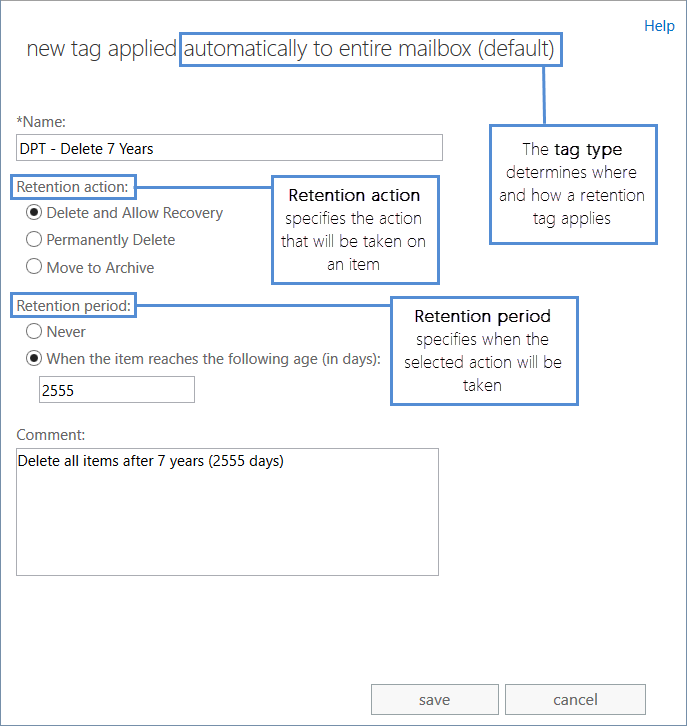 For details about how to create retention tags, see Create a Retention Policy. > [!NOTE]> You can't link more than one RPT for a particular default folder (such as Deleted Items) to the same retention policy. > [!TIP]> Many personal tags in a policy can confuse users. We recommend adding no more than 10 personal tags to a retention policy. For a list of management tasks related to retention policies, see Messaging Records Management Procedures. For more details, including a list of retention tags linked to the policy, see Default Retention Policy in Exchange Online and Exchange Server. You can also use the Start-ManagedFolderAssistant cmdlet to manually trigger the assistant to process a specified mailbox. To learn more, see Configure the Managed Folder Assistant.